(Minnie Mouse Ears) Floriferous and heat tolerant, Cuphea 'Minnie Mouse' is is also a long-blooming addition to wildlife gardens. 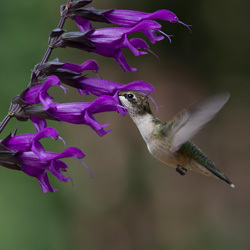 Similar to Salvias, Cupheas are rich sources of nectar that fuel hummingbird migration. Bees, butterflies and hoverflies are among the other pollinators that love this genus. 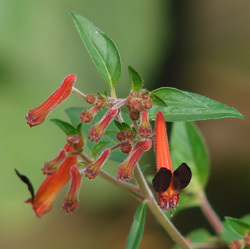 The tiny, bright red-orange flowers of Cuphea 'Minnie Mouse' don't have true corollas, but each blossom has two dark purple petals at its tip, which stand up like elongated mouse ears and form a "face" complete with whiskery stamen poking out of the flower's tube. Similar to all Cupheas, Minnie Mouse has barrel-shaped blossoms that merge flower with calyx and are called tube-calyx flowers. It is a member of the Lythraceae family and a fine companion plant in Salvia gardens. Overall there are 260 species of Cupheas and most are native to Mexico, South America, the Caribbean and parts of the American South. Face-type Cupheas have two to six petals at the opening to their tubes. The two-petal types sometimes are also called bat- or bunny-ear Cupheas. Other members of the Cuphea genus have no petals and are called cigar or firecracker Cupheas due to their hot colors, shape and raggedy tips that look like they are smoldering. Cupheas are perennial in climates with moderate winters where they grow well in full sun to partial shade. 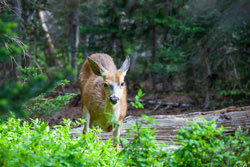 Outdoors, they are fine groundcover, edging or container plants. Although they thrive with average watering based on local conditions, Cupheas are water-loving plants that can serve as a solution in moist areas of your yard. In areas with cooler winters, Cuphea 'Minnie Mouse' can be a houseplant or seasonal bedding choice. (Blood Red Mexican Sage) From summer into fall, the fuzzy, deep red flowers of Salvia univerticillata attract hummingbirds. This sage from Chiapas, Mexico, blooms well in sun or partial shade. I wanted to say thank you. The plants are in fantastic condition, big and healthy, and are even better than I expected. I can't get over how nice they look. I will definitely shop from you again.